Cut the woody end off of the spears. 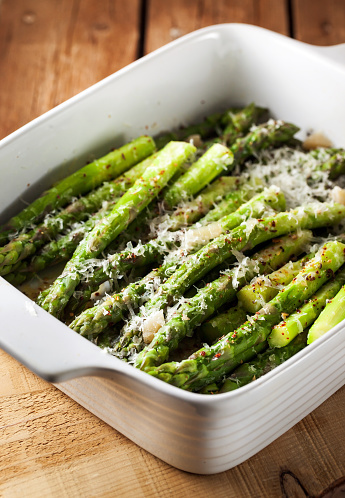 Put the asparagus in a large frying pan and pour in just enough hot water to cover them. Put a lid on the pan and cook the asparagus for two minutes, or until bright green, crisp and tender. Drain well. Drizzle a little bit of olive oil, season with pepper and sprinkle with freshly grated Parmesan cheese.